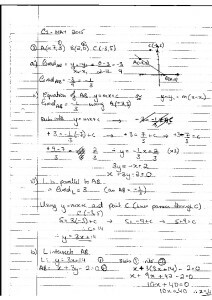 Written solutions and methodology for the C1 paper (unofficial), click on image to download. Small error in Q5(a) of C1 2015 – You have missed the second -10k, which would give the correct answer of -25/4 (same for (b)). Thanks for pointing out the error Stephen. Much appreciated. Q4b, you’ve missed a root. Thanks Jilly. It appears that I may have rushed these solutions a little bit! I’ll endeavour to put up a “clean” copy when I have time.